Supercharge your motivation, learn something new, and be entertained with uplifting health podcasts. We all have days where the couch is oh-so-comfortable, our thoughts get stuck on comfort foods and keeping on the healthy track is hard. These are the days when some encouragement and inspiration is exactly what we need to remind us why we make the choices we do to stay fit and well. When you need a dose of motivation to stay on your wellness journey, look no further than your phone. No, not blogs, or websites, or fitness apps – podcasts are the latest must-have tool in your inspiration kit. Whether you're looking for information, motivation or entertainment, podcasts are a fantastically engaging way to feed your mind. 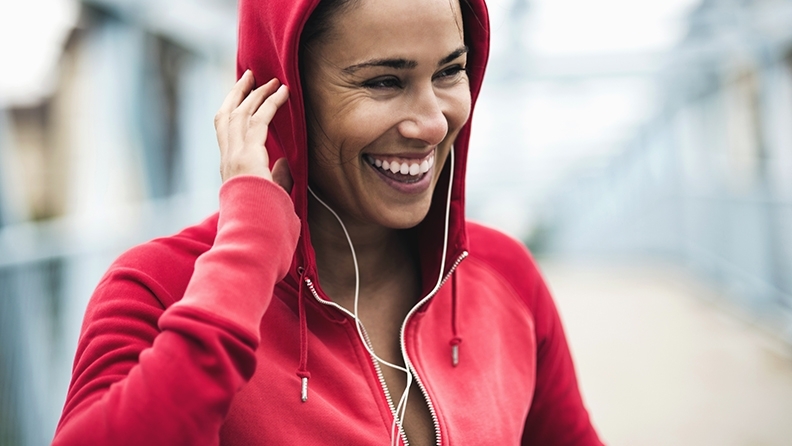 When it comes to health and wellbeing, podcasts can provide scientific explanations, reviews of the latest research, a range of useful tips and tricks, and plenty of inspiring stories. All of this can get you excited about healthy living – and best of all, give you a new, empowered way of thinking about health. If you haven’t yet dipped into podcasts, now’s the time! Welcome to a huge new world, where educational and entertaining information about any topic is available for free, whenever you’re ready to listen. Walking the dog, gardening, ironing and folding laundry are the perfect times to get inspired, learn something or broaden your thinking. Podcasts are audio recordings, broadcast in a radio style format. The content can range from an episode of a radio show, to education about a specific topic, an interview with an expert, a round table discussion, or anything else. They might be as short as 10 minutes or as long as an hour. They’re free to download and to subscribe to a series. How do I download podcasts? There’s a podcast app icon on iPhones and iPads, which gives you access to all the podcasts on iTunes. There are also apps you can download such as Overcast for iOS and Podcast Addict for Android devices. Search the topic you’re interested in (mindfulness, motivation, nutrition…) or browse the top charts. Pick an episode, download to your device, and start listening. If you like what you hear, subscribe to download new episodes automatically. "Whether you're looking for information, motivation or entertainment, podcasts are a fantastically engaging way to feed your mind." Whatever your health goals, whatever time you've got to spare, you’re sure to find a podcast to inspire you. If you’re looking for tips, an inspirational story, or just a new perspective, there’s a bounty of choices. Here’s my pick of some of the best health and wellbeing podcasts out there. For science-based advice, this podcast by ABC Radio National is full of fascinating information on a range of health topics – perfect for answering those “I wonder how that works” questions, and giving you something interesting to say at dinner parties. Have you always wanted to get from the couch to running 5k? This podcast will get you there, one day at a time. TEDTalks are famous for bringing together the most engaging speakers in every field, talking passionately about what they know best. Check out psychologist Guy Winch’s presentation on why we all need to practice emotional first aid. Relax and relieve stress with a guided meditation from the UK’s Mental Health Foundation. This warm and engaging series brings together three inspiring women, all professionals in different wellbeing fields to discuss health, nutrition, relationships and mindset, and how to live a more positive and fulfilling life. This is another great series grounded in science, looking at health and medicine and how it affects our lives and society. Slow down and get mindful – this show is full of tips and tools to help you begin or strengthen your own mindfulness practice. Three entertaining wellbeing professionals chat about all things healthy living, sharing ideas and tips for nutrition and everyday wellness. Full of real-life stories and interviews that are sure to get you thinking, this podcast is all about wellness and wisdom and wonder. Fall asleep to bedtime stories for grown-ups – just interesting enough to distract you from your worries, but boring enough to let you drift off into dreamland.